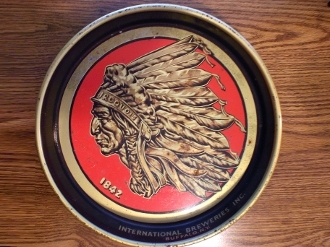 Iroquois Indian Head & Ale beer serving tray by International Breweries, Inc. Buffalo, NY. Circa 1955 - 1967. Red, gold & black tray with usage surface rust throughout giving it that natural vintage look. 13" diamiter with 1 3/4" dip. Nice display piece.